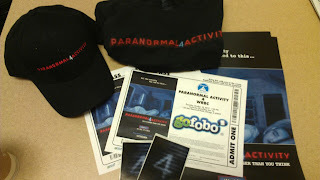 WRBC: The Blaze: Paranormal Activity 4 Giveaway! To help celebrate the month of October and all things scary we are giving away a Paranormal Activity Prize Pack! Included in this package are two tickets to see the movie, a shirt, a hat, stickers and poster. For your chance to win all you have to do is go to our Facebook page and message us with what you think is the scariest monster and why. The one we think is the best will be the winner, submissions will end on October 14!